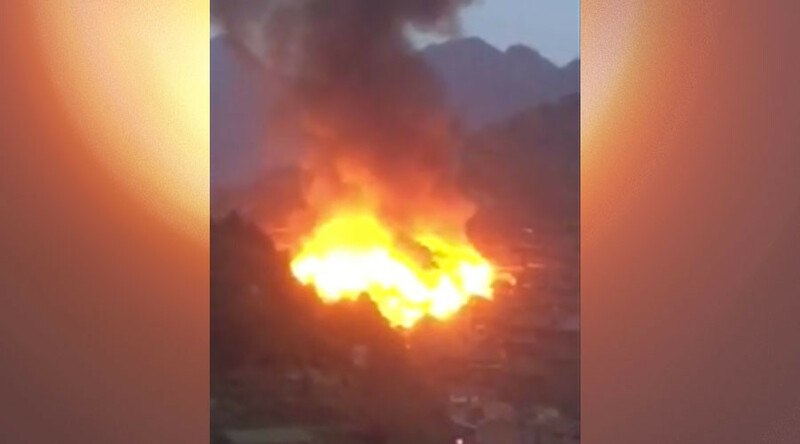 A blazing fire broke out in southwest China’s Guizhou province Saturday, devastating homes in Wenquan village. The fire started at around 6:00pm local time and dramatic images of huts, cottages and chalets engulfed in flames spread online. Strong winds and the homes’ close proximity to one another meant the blaze spread quickly, catching five to six huts within ten minutes, reports Sohu.com. The vast majority of homes in the affected area were made of wood. Over 20 vehicles and 100 soldiers were dispatched to the scene to assist in fighting the flames, reports ChinaNews.com. By the time the blaze was eventually extinguished at 11:00pm, scores of homes had burned to the ground, affecting hundreds of locals. Casualties are not yet known, according to numerous local media sources. This isn’t the first fire to devastate the mountainous region; 500 homes were damaged in a December 2014 blaze in the historical Jiuyang township Cuci Miao.